Open Performance Academy (OPA) is a research programme for young and established artist whose work engages, intersects with, discusses, draws upon, or is indebted to performance art. OPA organises lectures, workshops and try-out sessions, aims to create a platform for the exchange of ideas and the production of knowledges and provides artists with an opportunity to receive feedback on their work. 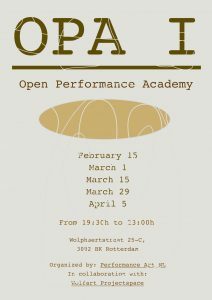 OPA is an offshoot of Performance Art NL, founded by performance artist Ronald Bal and university based researcher and lecturer Nathanja van den Heuvel. This early spring 2018 OPA starts with a first series of meetings dedicated to an exchange of thoughts, ideas and practices. The first series take place on Thursdays between 7:30 pm and 11 pm. The dates are: February 15, March 1, March 15, March 29 and April 5. The readings will be circulated prior to the meetings.